When I moved back to Lagos, there were like a million things I was so worried I won’t ever find here. One of them being good quality hair extensions. I had only ever ordered extensions from my trusted stylist Bridget, when I lived in London, and no matter how many times she increased her price by £10 – £15, I would still faithfully repurchase from her. Not because I had money to chuck about, but because I trusted her and knew she won’t sell me sub-standard extensions. I have bought extensions while I have been back, but they have all been of terrible quality, bar one. A couple months ago, I received an email from a lovely lady called Anne. She said she owned a virgin hair extension company, AnneElise Real Hair*, and her extensions were Argentinian/Spanish mix. Immediately my guard went up, I thought “Nah, I’m not interested. I’m fine with the extensions I’ve got”. I immediately replied with a very skeptical email and a bold disclaimer, saying I will be very honest with my review and if I do not like it I will let her know. Or something along those lines. I also decided to meet with Anne first, look at her products and have a little chat. About a month after she contacted me, we met-up and BOY, was I impressed. Anne really knows her stuff. We talked for about 30-45mins about just hair! Crazy. She actually sources her ponytails and then wefts them herself. Ok, well she doesn’t personally sew the wefts but she’s got her staff to do this. She actually showed me a video on her phone of her girl wefting a ponytail. I was gobsmacked! I never knew what exactly went into creating those 100g bundles we purchase. One very important piece of information Anne told me was the reason why certain extensions ‘Shed’. Now we all do it, when we get our paws on potential hair extensions we want to buy, right after we ‘sniff’ it (don’t act like you don’t know what I’m talking about), we proceed to run our fingers through it, tugging a little as we go along. And then if it sheds, we conclude the hair is bad quality. 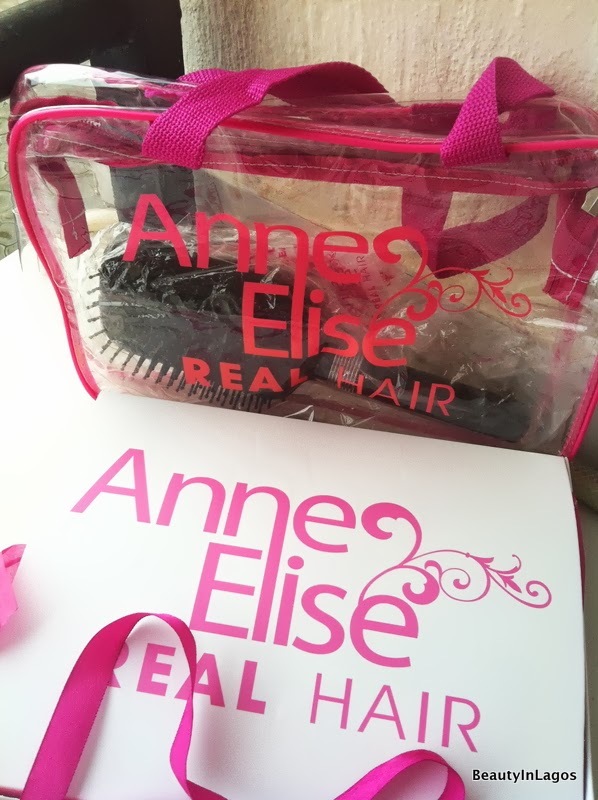 Anne told me that because hair sheds, it doesn’t necessary mean the hair isn’t of good quality, it simply means the wefting wasn’t done properly and that could just be a waste of perfectly good quality hair. She also mentioned you can then maybe get it ‘re-wefted’. OMG, if I go on about all I learnt from Anne during our meeting this will turn into a very ‘wordy’ post. So on to the photos. 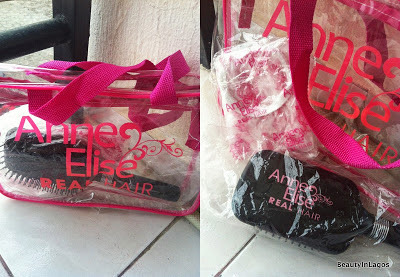 In the bag she sent me, she also gave me some of her branded hair-care merchandise. A lovely clear WashBag which contained a Paddle-Brush and a Shower-Cap. I have mentioned before I am a sucker for cute packaging/presentation. I LOVE when I can see that the company prides itself on its appearance. This is the cute packing with the pink bow… And it’s all PINK!! And pouch the bundles came in. These are the bundles I received. Now she gave me samples, so the bundle sizes I received weren’t the typical/standard 100g. Typically, one bundle is 100g, and a full-head you’d normally need 300g (3 bundles). But if you love ‘big’ hair like I do, I go for 5 bundles of (100g each). Totaling approximately 337g in total. They come silky-straight. And that’s how I wore them the first few weeks. And they were perfect. 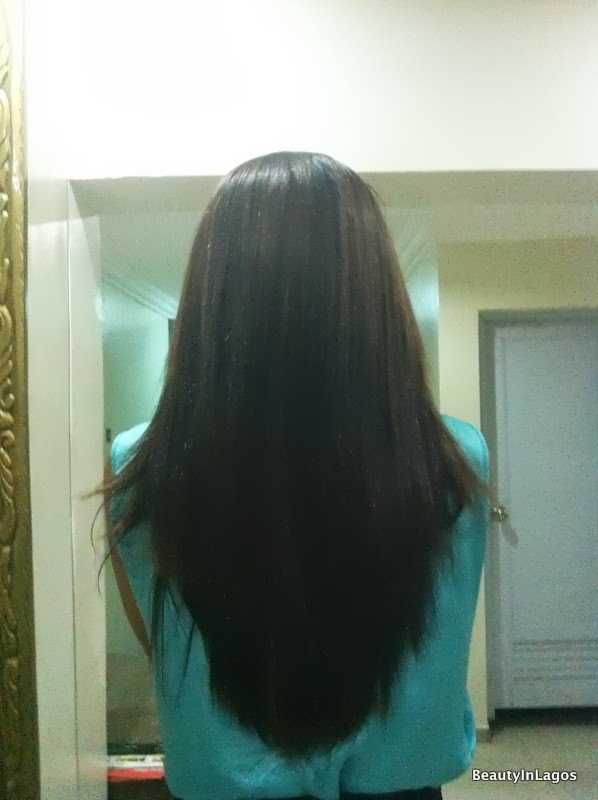 I did not trim or cut layers into the hair, I had them installed normally with the longer lengths at the bottom and worked my way up to the top with the shortest piece. 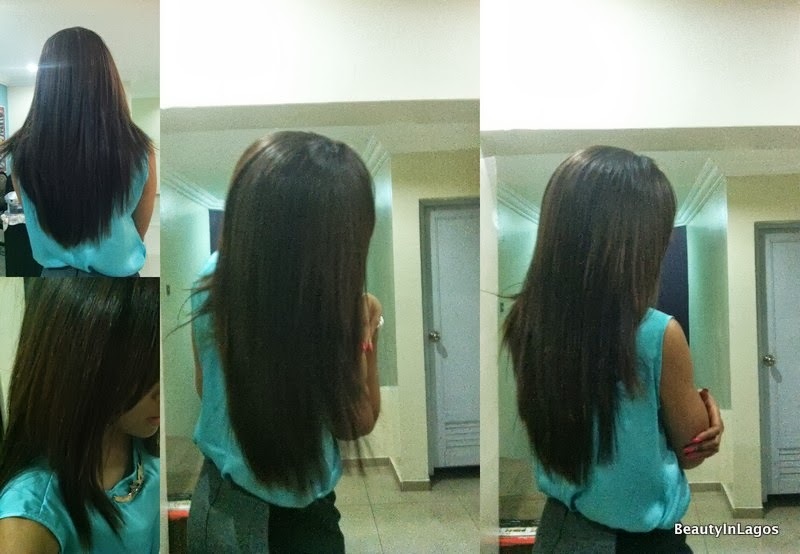 After a while, I wanted a change and also to see how versatile the extensions were. 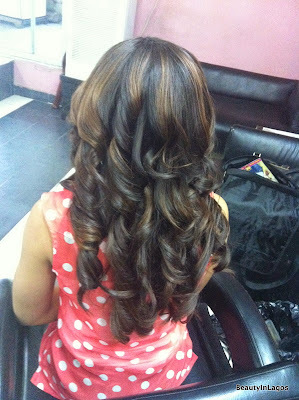 So I went to the salon and had it curled. To achieve these curls, my stylist blow-dried the hair first then curled using a straightener. My stylist, Laurent, can LAY a weave trust me… He’s amazing! Just one word to describe these extensions… AMAZING! Honestly the BEST quality virgin hair extensions I have ever used. I have had them in for 5weeks now (obviously I have taken them out, conditioned and re-installed over the period), and did not want to write-up a review before the 4-week mark. But I have been bursting at the seams to tell you guys about these extensions. 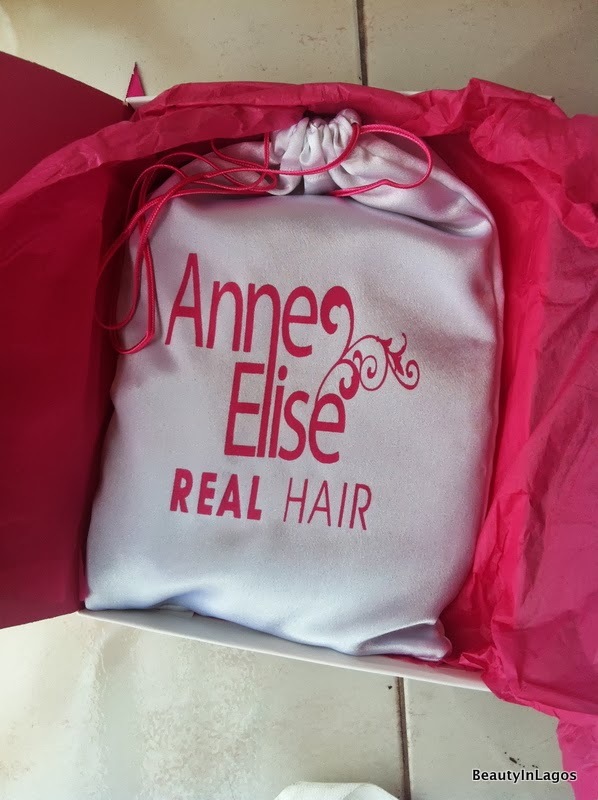 I have already recommended to a few friends and they’re loving theirs.They are of very high quality, every hair stylist I’ve been to has gushed about how the hair is so soft and easy to work with. To say that it doesn’t shed at all will be exagerrating a little. But this hair barely sheds, and I am really holding myself back from saying it doesn’t shed at all. I will say minimal shedding occurs with this hair. It comes silky straight and very easy to maintain, but you can also get it wavy/curly using heat and then flexi-rods in every night, to maintain the curls. The curls will drop a little as the day goes on, but nothing dramatic. I really have not got anything negative to say about these extensions. I will hand-on-heart recommend this to anyone that asks. And you all know I won’t recommend just because I was sent this hair to review. If it were horrible, I would rather not mention it on the blog, than endorse sub-standard products. 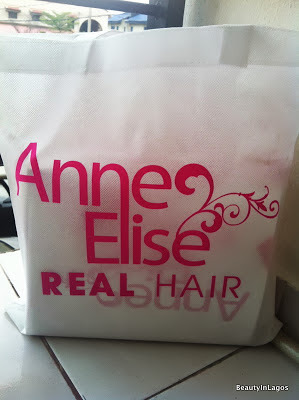 AnneElise Real Hair is based in Ikoyi but they deliver anywhere in Lagos. Abuja purchases can be arranged on request. Hope you enjoyed my review. I tried to keep it short, but I really had some info I HAD to share. Hello Jaiye. 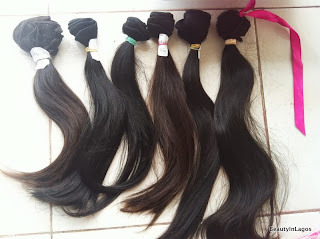 I did not say there wasn't any Hair extension company in Lagos, I said I hadn't found any that met the standards I wanted, except one. 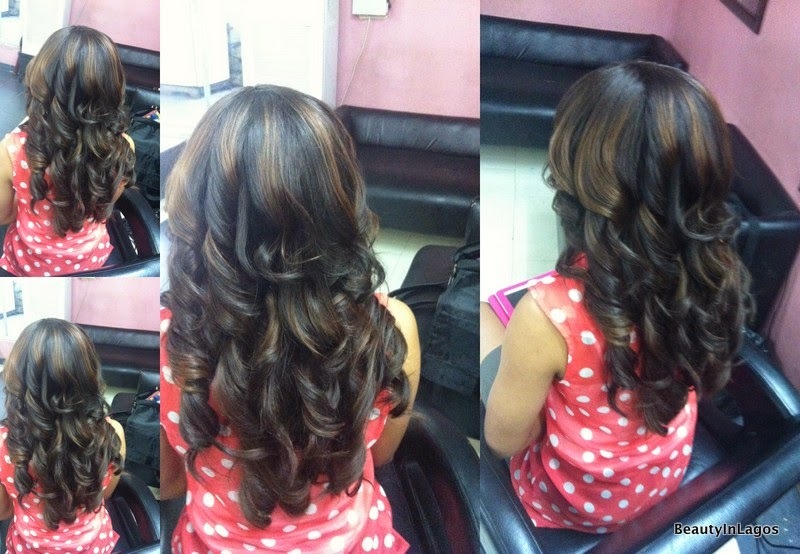 And I don't 'claim' to get my hair done at Blush Beauty, I actually get my hair done there. The 2nd set of pictures were taken at Blush. Your blog has been soo helpful! I'm almost rounding up my master's as well and should be home in September. I'll say I'm not so worried about getting most items anymore. Your recommendations are superb. Thank youu!!! Thanks Ez,was gonna ask about Laurent but I see you put up his details, many thanks..I actually saw you with the hair in person one day at Rhapsody..was gonna say hello but there was some 'Champagne' drama..lol dunno if you remember.. I love how civil your reply is! Jaiye! Abi kilo oruko eh! Dnt let me drink anoda man's panadol on ur head! If ur broke, say so! We all knw ez doesnt give fake gist n she's really been helpful 2 us gals. Btw: nice hair jare EZ. Nice blog! you should've said hi!! :(.. lol. What Champagne drama?? No I don't! Hey hun! I guess she just misunderstood what I typed in the post! Let's just leave it at that! oooh nice. The hair really looks lovely on you. I'll bookmark this page so I can contact her when I move back. Oh My Word!!!! You were there?? What was that girl liiiikkkeeee!?!?!? She was hilarious and embarassing lol! Were you one of the two ladies sat at the bar to my left? Hello! I've tried contacting this lady but she neither picks her phone or responds to emails..help please? Sorry you were not able to contact me. I am not in the country presently but back soon. I answered all emails I have seen so I will check in my spam box in case your mail went there instead. This is nice. You have an interesting blog, I was happy I was able to drop by. Informative yet not boring, I'm definitely having a good time reading this. Lady, you've sold yourself and this product with your maturity in replying Jaiye. That was enough to win me over. Will look out for that good hair when i am in lagos. In addition, i love love love the pink packaging. Hey Ez! I love the highlights you added to the hair, just wondering if you did it yourself or at a salon? If so, please which one?